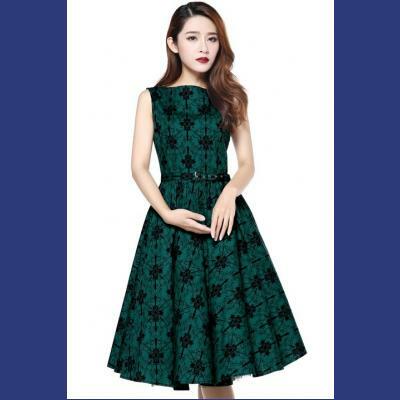 Patsy green cotton rockabilly dress has a pretty delicate black print. 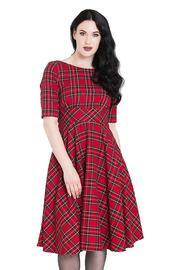 The skirt which flares from waist to hem and can be worn over a petticoat to add more volume. 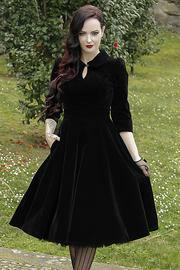 The petticoat worn in the photograph is not included. 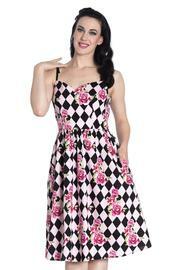 The dress has a side zip fastening and a removeable belt. Fabric: cotton with some stretch, 97% cotton, 3% spandex, machine wash, do not tumble dry. Standard size approx. length: 40 inches. Skirt approx 27 inches. Plus size approx. length: 44 inches. Skirt approx 27.5 inches. 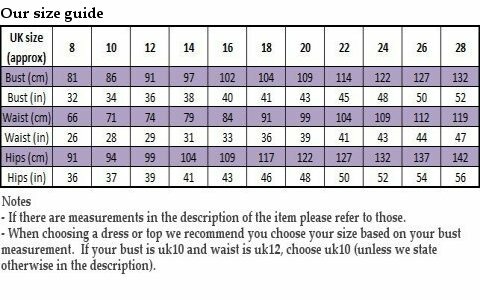 Plus Sizes - all plus sizes are labelled in American sizes, so a UK26 is labelled 24.